Knuffle Bunny and its sequel, Knuffle Bunny Too, work great for a mini lesson on predicting. 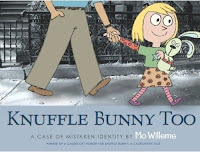 Begin by reading Knuffle Bunny, stopping to model predicting. My first planned prediction was at "Trixie realized something." What did she realize? Then, as they progress home with Trixie trying to explain with her "Aggle flaggle klabble!" and "Wumby flappy?!" my plan was to predict some more. What would she be so panicked about? My fourth graders noticed immediately, however, that Knuffle Bunny was in the laundry basket and then in the washer. When they pointed that out, I did an unplanned prediction. I mentioned my favorite Oscar the Grouch from childhood and we discussed the blankets or pillows or stuffed animals everyone had (eh-hem, have) and what it would be like to leave it behind. That got them talking immediately. I predicted a Trixie meltdown. 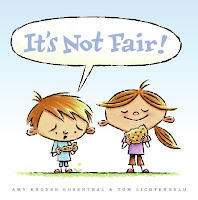 So, now back to my plan, I paused again at "But Knuffle Bunny was nowhere to be found...." and opened up the discussion to student predictions. What do moms and dads do when a favorite toy is lost and the child is giving the puppy dog eyes and quivering frown? Get a new bunny? Tear the place apart? They seemed to be in agreement that Knuffle Bunny, whatever the cost, would be found. We then progressed on to Knuffle Bunny Too. Trixie is now older, quite a talker, and headed to Pre-K. She has great plans to show Knuffle Bunny to Ms. Greengrove and all her friends. Our first prediction was when "Trixie saw Sonja." What would cause Trixie to have those big eyes and shocked expression? What's up with Sonja? After continuing through their conflict, including an argument over the correct pronunciation of Knuffle ("Kuh-nuffle," says Trixie. "Nuffle," says Sonja. ), Ms. Greengrove takes away the two instigating bunnies, exiling them to the top of the cabinets. The rest of the day progresses nicely until the middle of the night when "Trixie realized something." Prediction time...what did Trixie realize? Then Trixie marches into her parents' room and announces, "That is not my bunny." The next page, which I didn't show, says, "Trixie's daddy tried to explain what '2:30 a.m.' means." This is where I stopped and sent the class back to their seats to predict what would happen. How do parents feel about being woken up at 2:30 a.m.? How do kids feel about not having their bunny? How parent feel about kids who don't have their bunny? Many kids predicted a late night solution of some kind. Some even predicted that Trixie and Sonja would become friends. No one, however, predicted that they would intentionally trade bunnies the very next day. This allowed us to discuss the fact that good predictions, based on prior knowledge and information from the book, are not always right. Or, to put it more positively, was your prediction correct or did the author surprise you? 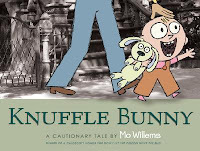 All kids have a blanky or stuffed animal or a woobie (see below), so all kids can relate to Knuffle Bunny. (I had an Oscar the Grouch who helped me take on a tonsillectomy.) Trixie accompanies Daddy to the laundromat, Knuffle Bunny securely under her arm. But as the title says, this is a cautionary tale. Children, take heed! When helping Daddy with the laundry, or when doing any other necessary activity accompanied by Knuffle Bunny (or your personal equivalent), don't become distracted. Trixie becomes distracted. As she assists Daddy with the dirty clothes by flinging them haphazardly around the laundromat, Knuffle Bunny is temporarily forgotten. Watch the illustrations closely and you'll see the result before Trixie realizes it. Thank you, Trixie, for allowing children everywhere to learn from your unfortunate experience. Half way home, Trixie realizes Knuffle Bunny is not with them. She tries to tell Daddy. "Aggle flaggle klabble!" she says. "Blaggle plabble! Wumby flappy?!" she explains. When her explanations don't work, she's left with no choice. She bawls. She goes boneless. Mom recognizes the problem as soon as they get home. After a frenzied retracing of steps, Knuffle Bunny is rescued, and Trixie surprisingly speaks her first words. Any Christmas story that’s true, guaranteed true, especially, better deliver with A. a good story and B. proof of its truth. Red Ranger Came Calling does both. 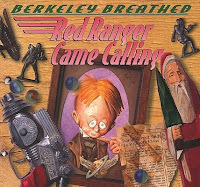 Berkeley Breathed tells the story of his father as a nine-year-old and the events surrounding Christmas in 1939. His father, Red, was sent to stay with Aunt Vy on Vashon Island. Red emulated the famous movie hero of the time, Buck Tweed, Red Ranger of Mars, Protector of the 23rd Century and Savior of Grateful Princesses. It was Buck Tweed that instilled in Red a desire for the ultimate Christmas gift: an official Buck Tweed Two-Speed Crime-Stopper Star-Hopper Bicycle. Unfortunately, at this time in history, “dreams were unaffordable.” The best his Aunt Vy could do was a Buck Tweed space uniform which, upon further inspection, turned out to be last year’s pajamas, dyed red, and creatively altered. A sour-faced little boy, Red never gave much thought to the feelings of others, Aunt Vy and her creativity amidst the circumstances included. In bed that evening, Red remembers local resident Saunder Clos, the recluse some locals believe to actually be the Santa Claus, and the mysterious pointy-eared man he saw headed towards Clos’s house. So Red shot him with his disintegrator ray gun. Pop! Suction cup dart on the forehead. But Red ignites something in the old man. Can he still make a reindeer fly? Can he still fulfill wishes, even those of boy not usually inclined to wish? Saunder Clos decides to try. And so does Red. The events of the evening persuade him to wish, despite his mind’s expectation of another disappointment. He wishes, hoping his wish won’t fall on deaf ears, even though the old man’s ears are, nearly, literally, deaf. “An Official Buck Tweed Two-Speed Crime-Stopper Star-Hopper bicycle,” he says. And Christmas morning brings … nothing. No surprise. No sadness or self-pity. Not even disappointment. Nothing. Except anger. Red had allowed the old phony to trick him into the unthinkable. Faith in grown-ups. And the old man was gonna hear about it. But upon arrival, Red discovers something much more important, a gift he gives to the old man. Red also discovers that Saunder Clos (or is it Santa Claus?) did indeed deliver on the promised bicycle. Exactly as he heard Red wish it. Oh yeah. The proof. Here it is. Don’t believe me? Don’t believe Mr. Breathed? Do your own Google search. 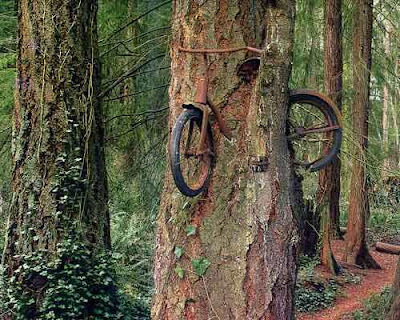 Here, I’ll save you the time: Vashon Island Bicycle Tree. Living nearly halfway between Oshkosh, Wisconsin and St. Paul, Minnesota, yesterday's decision was heavily debated in the household. 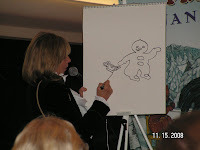 Should we go to Oshkosh to see Jan Brett or visit St. Paul to hear Tomie dePaola? Two nearby author visits on the same day. Ah, shucks. One or the other. 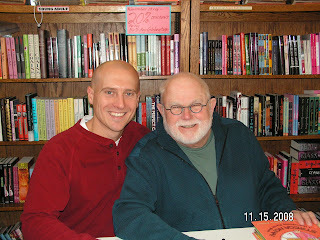 Tomie dePaola and St. Paul, we decided. Minnesota is our old stomping grounds, and a visit to the Red Balloon Bookshop is always a bonus. We then headed to the Mall of America for lunch and some shopping. When we got off the elevator in front of the Barnes and Noble, we were greeted by a sign promoting a visit from Jan Brett. Apparently, after a visit in Oshkosh, she headed over to St. Paul! Our decision was well made...or just lucky. 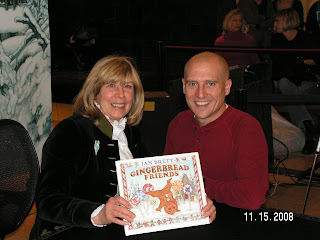 Mrs. Brett shared information about her newest book, Gingerbread Friends. 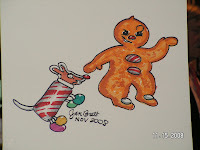 The rooster that pulls Gingerbread Baby's sleigh is actually one of her chickens, and the mouse that Gingerbread Baby meets in the bakery is the same visitor to a basket of gingerbread cookies at her home. She also gave everyone a great art lesson about creating three dimensions and how draw reflecting light. Both authors were incredibly entertaining, gracious, and patient, and while our day ended a lot later than initially expected, it was well worth it. Thanks to Tomie dePaola and Jan Brett from me and the entire family. Oh yeah. 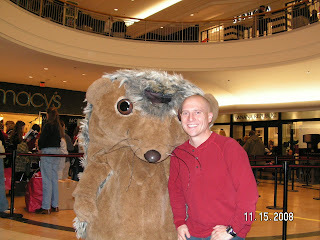 Hedgie was cool too. It might be a bit early to wish everyone a Happy Thanksgiving, but then again, Christmas decorations were out before the Halloween candy was put away. By that standard, two weeks isn't early at all. Here's a link to my latest newspaper column...and Happy Thanksgiving, everyone. Ignore, for a moment, the fact that there are trading cards and websites and games and prizes all associated with The 39 Clues. Pay no mind to the kids who might spend as much time, if not more time, studying the cards and entering and deciphering codes and wondering what the heck is up with Nessie Lives (look closely at the copyright page). Okay, just kidding. Don't ignore that stuff. First of all, when the cards, game, prizes, website, and $100,000 are all mentioned on the front and back covers, you can't ignore them. But second, and I'll admit it here, but only in small font: that stuff is kinda cool. And I'm not saying it again. It sounds sort of blasphemous to a reading teacher. But facts is facts. Their quest takes them to the library (of course), Philadelphia, Paris, another library (woo-hoo! ), and underground. They nearly die (this is just top-of-the-head recall, now) three times - in the aforementioned house fire, getting lost underground, and being buried in wet cement. Wait! Four times! There's a bomb too. There's probably more, but I'm moving on. Amy and Dan encounter invisible ink, maps, codes, anagrams, diagrams, and signs in foreign languages. They are instructed to trust no one. Non-stop action, near death experiences and narrow escapes, puzzles and codes (one even hidden in the page numbers) all will draw readers into the book and, indeed, the series. One student of mine hasn't finished the book yet, but he's already registered at The 39 Clues website, has all his cards entered, and has obtained exclusive online cards as well. Without much effort, here's some pieces I've stitched together. A code in the book says that Anne Cahill did not drown. On the cards included with the book, Nella Chain is listed as a passenger on the Titanic. Here name is an anagram for Anne Cahill. Another card says that a Titanic expert's prize artifact is a cameo from room B77 on the Titanic. Who stayed in room B77? According to the passenger list on another card, it's Nella Chain. Another admission: I'm registered on the website too. Don't tell my wife. Or my principal. Know any kids who would get into this? 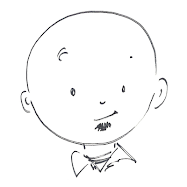 The second book, One False Note by Gordon Korman, will be released in December 2008, and the third book, The Sword Thief by Peter Lerangis, soon after in March 2009. Book One author, Rick Riordan, has mapped out the ten-book series, but different authors will write each book.